Today Amina started a new school: Best Friends Early Childhood Program at the United Cerebral Palsy Association of Philadelphia and Vicinity. Their program integrates special needs and typical children and they have a PT, OT, speech therapist and a nurse on site, so Amina can get all of her early intervention services there. Its typically a pretty tough program to get into due to long waiting lists from parents of all kinds of children eager to make sure their kids get quality daycare services and a little extra. We doubted that we would be able to get a spot until Amina was 2 or 3, but with a little prayer and a little luck they had a spot open for this fall. Since it was the first day, we stayed with Amina for about an hour in the gym with her classmates and her teachers. ALL the kids were screaming as their parents tried to leave. One poor little kid screamed the whole hour. Another cute little boy was fine for a while, his dad snuck out and then about 20 minutes later when he realized he was left alone, he tried to make a run for the door out the classroom. Amina sat and looked around at the kids, and looked at us with sort of a concerned look on her face. She gravitated towards the little boy who cried the whole hour and kept trying to reach out and touch his head and his face. It was so sweet. Amina is not the only one going back to school. Last year I decided that I wanted to go back to school for my doctorate. It was in the midst of us dealing with all of Amina's issues, so I wasn't sure if I was going to apply or wait for a "better" time (whatever that is). I ended up applying, just figuring that if I didn't get in, it wasn't the right time, and I would wait a few years and try again. Well, I DID get accepted so I am preparing to start school next week. Lately, I have been feeling a lot of fear, anxiety and guilt about going back to school. When we started to sort out all of her medical issues, I took a job working part time so that I would have more time for her. I was going to the hospital at least 2 but sometimes 3 or 4 times a week for tests, therapy and other appointments so there was no way any employer would be able to accommodate me as a full time employee. Her appointments have lessened, and I have started to take more hours at work. With Amina at a school where all of her medical and developmental needs can be met, I think I will feel more comfortable being away from her, but I still wonder if I'll be able to do it. Time is already spread thin and when I am away from Amina I miss her and worry about her. I hear its typical that working moms sometimes feel guilty about the time they have to spend away from their families and I know there are a lot of parents in my situation, but its just hard. I know that in the long run, getting and advanced degree will be better for our family, but right now it means less time at home and more expenses. Its was to the point that I was actually considering NOT going back. My husband thinks I'm crazy to turn down an opportunity to study at one of the best schools in the country, but sometimes I feel like maybe that degree is just another piece of paper and time away from Amina is what really matters. This blog is supposed to be about Amina! 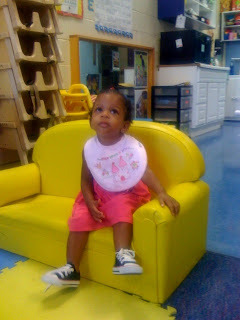 Sooooo, for her first day, we stayed about an hour to help her (us) feel comfortable with the new environment. But after about 20 minutes, Amina reached out for one of her teachers, gave her a hug and turned around and waved "bye-bye" to us. Before we left we (I) went into a loooong spiel about how she only eats mashed potatoes and oranges and how she doesn't like to sleep, and how she'll never stay still on her cot to take a nap. Of course she made a complete liar out of us. My little girl is growing up and I'm not ready for it! Good luck with school. It is a hard choice to make but in the long run it will be better for all of you. Love the picture of Amina. She is adorable. Oh my girl, you have a long haul in front of you. I will NOT lie and tell you it will get better. What I can tell you is your education is a blessing, you may have a hard time seeing it and feeling it, but it is for the best. Now will be the time for you and your wonderful husband to really "feel" parenting, things will mesh and leave you wondering "how did that happen and did we really remember all the stuff we were supposed to" we parents are amazing!